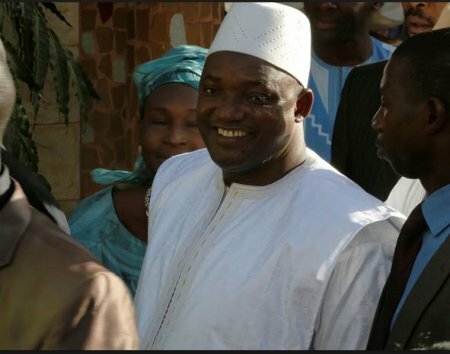 Gambia’ s President Adama Barrow will return to Banjul today to begin his tenure, almost 72 hours after long-serving serving ruler, Yahya Jammeh went into exile in Equatorial Guinea. Barrow, who has been staying in Dakar, the Senegalese capital since last week announced his departure on his Twitter handle and Facebook page today, hours after he announced his decision to pick Fatoumata Tambajang, 68 years old, as vice president. Tambajang’s appointment has kicked off some dust as she is three year older than the constitutional stipulation. The Gambian constitution prescribes a minimum age of 30 and maximum of 65 for anyone who wants to occupy the position of vice-president. Apart from the age controversy, Tambajang is well qualified for the post. She was educated in University of Nice in France, where she picked a Bachelor of Arts in French. She is also bilingual. She served as the Minister of Health and Social Welfare from 1994 to 1995 in the Armed Forces Provisional Ruling Council council. She was one of two female ministers in the cabinet, alongside Susan Waffa-Ogoo. She then went on to work for the United Nations Development Programme (UNDP) and in the field of development. Tambajang joined the United Democratic Party (UDP) in April 2015, during the Fass stand-off with security forces. She played a prominent role in the coalition that brought Barrow to power and believes that Jammeh should be made to account for all his atrocities and looting.